The response of most people I told I was going to Taste of London this weekend was pretty much the same - take lots of money, because you'll need it. For someone like me, who can somehow get through the best part of £60 just sipping cocktails in a London hotel bar of an afternoon, this was worrying. So I made a solemn pact to absolutely not spend more than the £20 worth of 'Crowns' (the festival currency) that came with the ticket and still try to make the most of what was on offer. 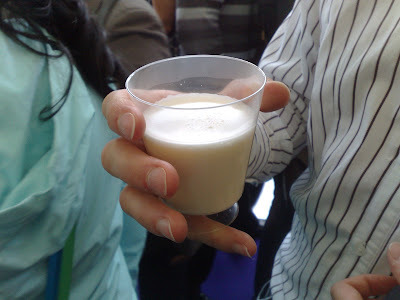 The first purchase of the day was a lovely Caipirinha at a bar whose plugged product I've completely forgotten. Yay advertising. 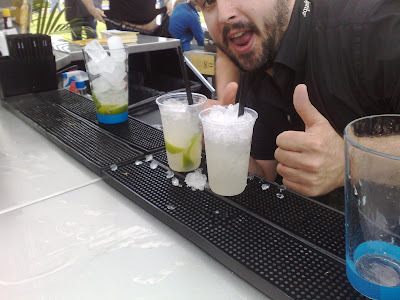 But the Australian bar staff were very cheery and the Caipirinha itself had just the right mix of brown sugar, crushed lime and cachaça. 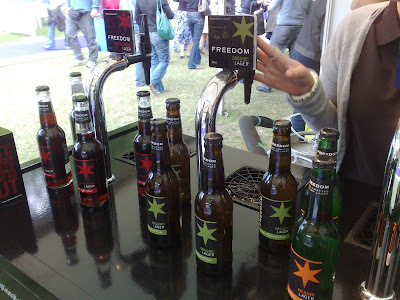 Our next stop was the Freedom Lager stall where I sampled a pint of their organic pilsner, and very nice it was too. If you want to try it yourself they have it on tap in a bar at the top end of Brick Lane. I know because I went there the other night - goes very well with a salt beef beigel. After liquid refreshment we were ready for our first food course, and a decision was jointly made to go for Gary Rhodes' (from Rhodes 24 restaurant) White Tomato Soup. This was really lovely - rich and creamy and despite its dramatic appearance tasted like a very well made tomato soup, which in fact it was. I wondered whether they used a special type of white tomatoes or whether they made a consommé and bleached it somehow. Clever stuff anyway. From Launceston Place we had a little paper cone of roast middle white pork risotto, which was light and fluffy but just slightly too sickly for my tastes - I've never been a big fan of risotto though so I'm sure others would have loved it. 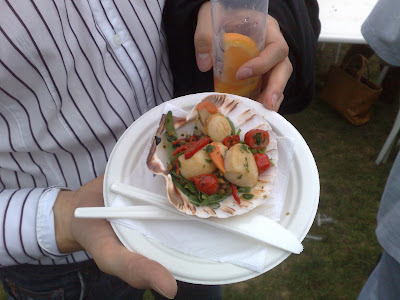 Scallops from Forntum & Mason (their new Fountain restaurant perhaps? I didn't ask) were only OK really. Prettily presented in the shell and the coriander and lentil mixture was tasty but the scallops themselves too tiny to have a decent crust. They were nice and sweet though. Next we tried a smoked salmon thingy from Rowley Leigh's Café Anglais - they pumped wood smoke into these little plastic containers so it all looked quite dramatic, but the effect was just a gimmick unfortunately as the salmon and baby watercress (literally all it was) was very dull once the smoke had evaporated. It was interesting, actually, how the plastic plates and cutlery provided an uncompromising level playing field for all the restaurants, and although the queue for Le Gavroche (2 Michelin stars) was massive, the dishes they were turning out (admittedly I didn't actually taste any) looked quite lost, whereas a more budget restaurant such as AWT's Notting Grill seemed to adapt quite well to the rustic festival atmosphere and their spit-roasted pig looked brilliant. I mean I know Taste is supposed to be all about fine dining, but if I'm sat in the grass on a hot summer's day with a beer in one hand, give me a pig sandwich over a foie gras terrine any day. I suppose if the worst you can say about the Taste festival is that it's a slightly posh cook-off/picnic then it's still worth a visit. 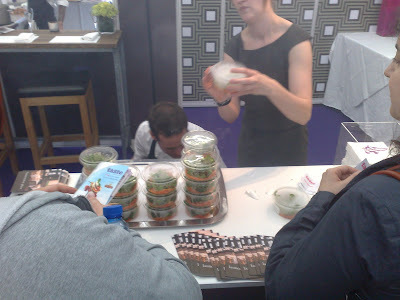 And although the opportunity was there to ram product launches down your throat (literally) at every stall, you have to give the festival organisers credit for keeping blatant mass-market PR stunts to the minimum and any high-street products tended to be organic (Rachel's Farm) or worthy in some other way. The only really blatant corporate gatecrashers were Cobra beer, but they won my favour by providing endless free samples while I filled in a market research survey for them and earned £5. Drink Cobra beer! See, it does work after all. We didn't stick around for Marcus Wareing's live demo at 21:30 but I did spot Angela Hartnett and Aiden Byrne manning their stalls, and I suppose it's only natural the level of involvment of the chefs at their festival tents reflected what goes on in the kitchens of the actual restaurants. I don't blame Gary Rhodes or Joel Robuchon wanting to kick back slightly now they're multi-millionaires, I just wish they'd stop pretending to still be head chefs. Or maybe I just deeply misunderstand the restaurant business. Yes, in fact, it's more likely to be that. 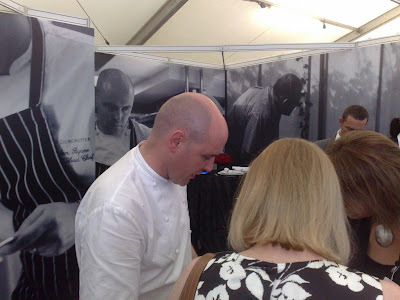 I will definitely be going back to Taste of London next year, and I think I'll probably still go along on the same ticket (the £35 Premium option). I had a peer through the glass of the VIP section and I can't say I'm annoyed I didn't pay £95 to stand up in a room of corporate freeloaders and BA employees. Certainly the potential was there to spend a fortune on food and drinks, but there's still plenty to do for the blogger on a budget as well. Here's to next year. It's certainly been a month or two of ups and downs around these here parts. I had barely got over the shock that the once-great Fox and Hounds gastropub on Latchmere Road seemed to be no long able to cook duck properly when my other favourite restaurant the Food Room was taken over by a semi-celebrity chef who constructs dishes out of a revolutionary new ingredient called "bland". 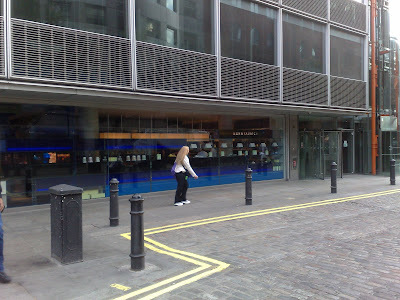 It was all very upsetting, and coupled with my new self-imposed budget I could see no easy way of the restaurants of London redeeming themselves any time soon. 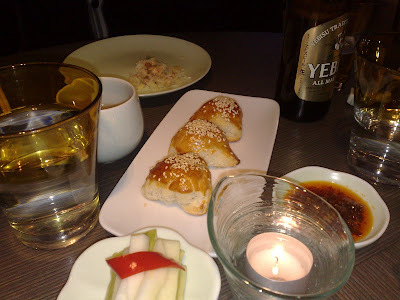 And then, out of nowhere, a delightful meal at an unpromising location in Parson's Green got the whole thing back on track, and this weekend the successful streak continued with a pleasing and pleasingly inexpensive meal at Yauatcha, Soho. 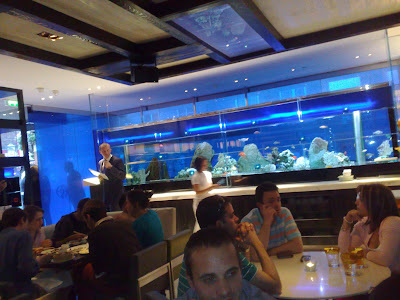 The word for the interior is "glamorous" - Yauatcha is a stunning room, all blue glass and tasteful lighting with a huge aquarium along one wall. And, hilariously, glamorous is the word they used themselves when we called to make the booking and enquired about a dress code. "Casual glamorous" they specifically replied - presumably this doesn't apply in quite the same way to the male diners, although this is Soho after all so who knows. Perhaps they just felt they couldn't get away with saying "no riff raff". I managed to sneak in under the radar anyway. 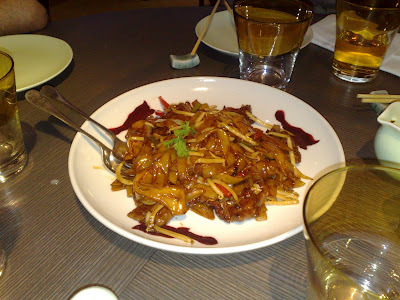 Once the dim sum were over with we were presented with a rather more prosaic Chinese dish of beef noodles, although even this had its merits. 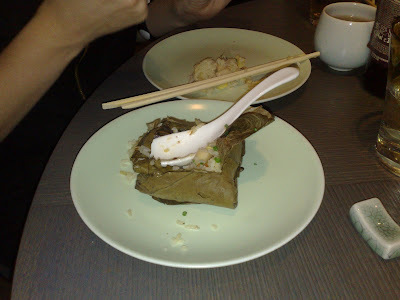 Also I should say that the jasmin tea-smoked spare ribs were a bit tough although the flavour was good. But the best surprise of all was that the whole kit and caboodle (including a cocktail and a few beers) came to little over £25 each including tip. Considering the effort that must have gone into each individual dish, this is very reasonable - and particularly in comparison to Hakkasan where I spent twice that on food which wasn't any better. Desserts - and apologies for the lack of photos but I was probably too busy eating - were very pretty and the best by common consensus was one involving passion fruit. Another tasted like Southport public baths and was somewhat less successful but at least they looked the part. All the desserts, along with a mouthwatering selection of macaroons, are displayed in the front window and the takeaway service appeared to be doing a roaring trade throughout the evening. 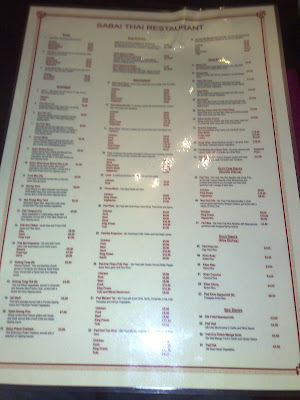 So add in smiley and attentive service (itself somewhat of a minor miracle in a Chinese restaurant in the UK) and you have yourself a great evening out. 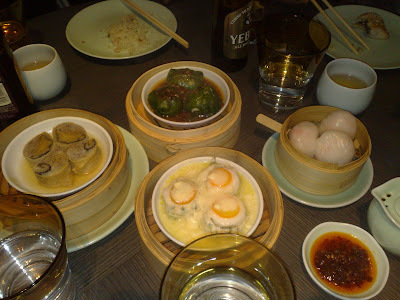 Yauatcha, along with Barrafina and Busaba Eatthai, has just been added to my list of places to eat in Soho, and is probably the best Chinese restaurant in London at the moment so you can do at lot worse than mosey on along and check it out for yourself. Parson's Green is a lovely villagey little part of South West London which is largely ignored by the rest of the capital, due presumably to the fact it's on the District Line, and as any Londoner knows 'travelling on the District Line' is second only to 'standing on the left of a moving escalator' in Things You Do Not Do. 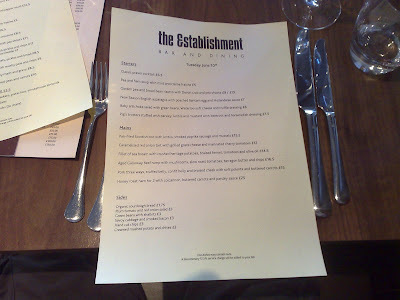 But after a painfully slow and uncomfortable journey from work last night I was rewarded with an unexpectedly delightful meal in The Establishment, a groovy new gastropub just opposite the tube station. 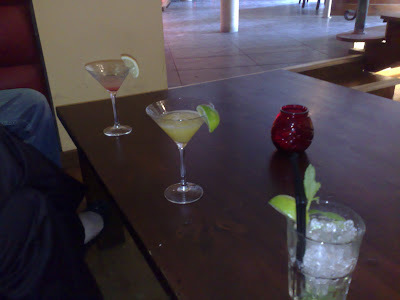 As often happens in those anticipatory moments before the food arrives, I found myself searching for clues to the standard of the evening ahead in other areas. 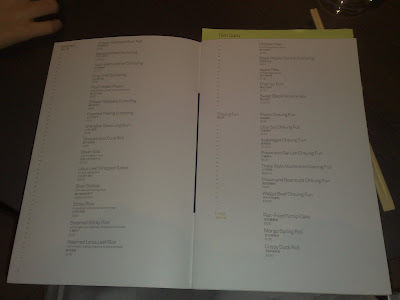 The bar menu is lovingly crafted and contains a number of interesting sounding house specialities along with the tried and tested classics. My Martini was served in an ice-cold glass, the rim rubbed with lemon rind and with just a hint of Noilly Prat - as good an example as you're going to find outside of the top hotels, in fact; clearly someone behind the bar knows exactly what they're doing. Service, it almost goes without saying, was great and although hardly rushed off their feet on a relatively quiet Tuesday evening the staff were welcoming and eager to please. 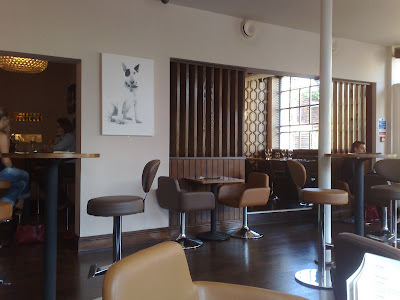 I should also give a mention to the impressive décor, which was incredibly tasteful 70s beige and bold wooden detailing. So far, so very very good. 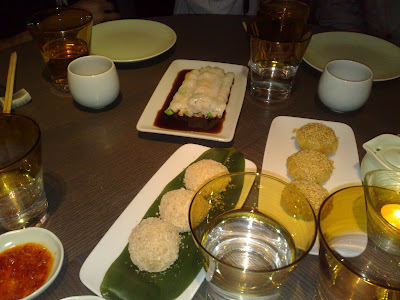 And the food, thank the gods themselves, lived up to my expectations and then some. 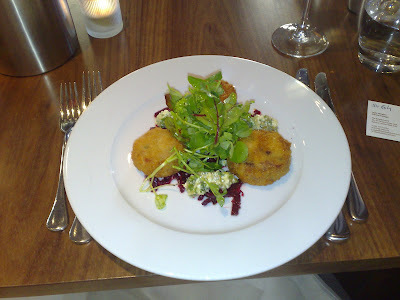 Starter of pig's trotter fritters with homemade gribiche was even better than that served at the Prince of Wales in Putney. Bursting with flavour and containing a delightful series of textures, the crispy delicate exterior broke on the bite to ooze meat juices and delicious fatty chunks of trotter. I broke into a giddy smile as the pork dribbled down my chin. Brilliant stuff. Next was more beautiful pork - a crispy chunk of crackling sat on top of a sweet chunk of cheek and a flat roll of bacon-style belly. Alongside, a gorgeous moist slab of more belly, and a scattering of buttery glazed carrots set in creamy white polenta provided vegetable accompaniment. 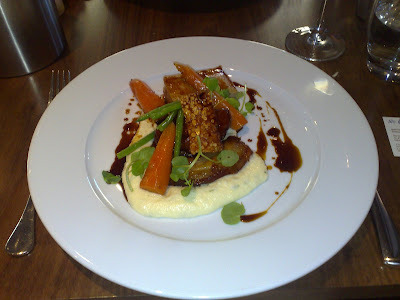 This is the pork dish that so-called pork expert Tom Ilic couldn't pull off in his restaurant in Battersea, but here it was done superbly and with each element cooked to a very high standard. 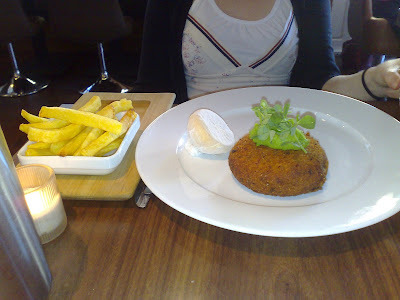 Maybe - and I have to put in some sort of disclaimer in case you go around thinking The Establishment is the restaurant equivalent of the second coming of Christ - maybe I was very very lucky with my choices, because a companion's fishcake (from the cheaper bar menu) was only good, not as heart-stoppingly brilliant as my two courses. And we didn't try the desserts either, so maybe they contain rusty razor blades or are laced with arsenic. I mean, there must be some reason why this place isn't packed to the rafters all day every day. So as you will have gathered by now, I can wholeheartedly recommend the Establishment to anyone willing to brave the District Line and head out to Parson's Green. And for food of this standard, that should be all of you. A nation notoriously proud of their food and wine heritage, and often quite rightly so, it's perhaps not surprising that France has traditionally tried so hard to protect its precious produce from foreign imitators. The Appellation d'origine contrôlée (AOC) is not a uniquely French invention - Spain, Germany and even the USA have similar laws to protect the integrity of their local producers - but nowhere else in the world is it more liberally used and enthusiastically enforced, with over 6500 French farmers and companies guaranteed by the system. One of them is the Normandy cheese Livarot, protected nationwide by an AOC since 1975 and Europe-wide (called a PDO) since 1996. The reason I mention the fussy French with their AOCs (does anyone remember when you could buy Champagne from Spain?) is because in an age where even the most unlikely countries are wising up to artisan food production and the standard across the board is rising, it matters increasingly less where those products are made and increasingly more how. 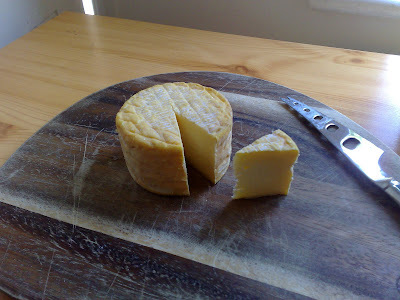 Stinking Bishop, for example, a cheese I reviewed last year, is a fine French cheese, soft flesh and alcohol-washed rind, that wouldn't look out of place on a cheeseboard anywhere in Europe. The fact it's made by an Englishman a few miles out of Gloucester is of supreme unimportance to me while I'm stuffing my face with it. Anyway, back to the matter in hand. 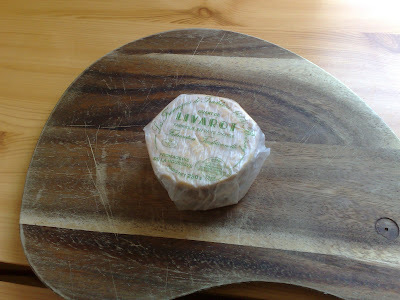 Prettily wrapped in bulrush reeds and with a sticky orange rind, Livarot would make an attractive addition to any cheeseboard. I'd been told to expect a strong odour and pungent flesh but sensing nothing too overwhelming on unwrapping it I had a sneaking suspicion this example was a little young; suspicions confirmed by a tell-tale chalky centre. 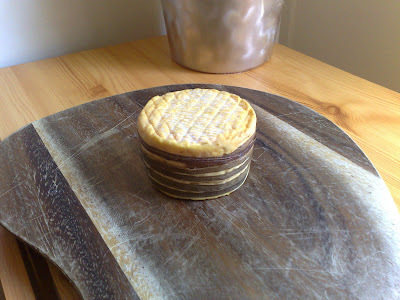 However despite this, the flesh near the rind gave a good clue to what a more mature cheese would offer - dense, earthy and salty and with the complex flavour you would expect of a top-quality cheese. In order to test my theory, I may revisit the Livarot later in the year - the season, apparently, runs May to September. It therefore seems a little harsh to rate a cheese based on what is possibly not the best example of its kind, but if John Lewis food hall is selling them, and people are paying good money for them, I think I'm entitled to mention it. And maybe if I keep my eyes open between now and September I'll find a Liverot-style cheese made in Somerset or Norfolk that's even better. Well, it will annoy the French, if nothing else. Not being a permanent resident of Liverpool these days, but instead a regular visitor on a roughly bi-monthly basis, I get to see the radical transformation of the town centre in a series of static snapshots. In October last year, Chevasse Park was nothing more than a bulldozed mound of earth separating the waterfront from a vast sealed-off building site. By February, mysterious nameless buildings had risen out of the rubble, but the area was still a no-go for curious onlookers and navigating your way from the Albert Dock to the town centre involved a convoluted and noisy diversion beneath cranes and dodging grumpy single-file traffic on Strand Street. Last week was the grand opening of Phase 1 of the Liverpool One complex, and Merseysiders finally had the chance to see the result of so many years of expense and upheaval. I'm no architectural expert (obviously), but it seemed alright to me. It's not a great work of public art, it's not 22nd century, but it's clean and modern and there are nice toilets. I was happy. For food lovers, however, progress moves at a different pace. Thanks to Liverpool One, the city now has it's first Pret a Manger sandwich shop, and while London is now quickly tiring of the ubiquitous aluminium-plated gaffs with their overly-mayonnaisey avocado wraps, the novelty is certainly on the side of the Liverpool branch judging by the crowds queuing up on Saturday afternoon. More exciting is the imminent arrival of a Gourmet Burger Kitchen when Phase 2 opens in September; every city deserves a decent beef burger, I always think - I'd like to give Natasha Hamilton's place in the Met Quarter (yes, her of Atomic Kitten fame) the benefit of the doubt, but I'm afraid the history of Z-list celebrity endorsed cafés isn't on her side, and I'm in no hurry to try her 'gourmet' offering. And for the record, if Gordon Ramsay ever releases a pop single, I won't be buying that, either. 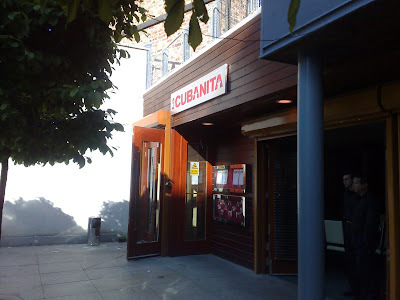 Instead, after a couple of decent cocktails in a cuban bar called Cubanita near Duke Street on Saturday night, we thought we'd try a new Thai restaurant called Sabai, located just opposite the new Beatles-themed Hard Days Night Hotel on North John Street. A word on Hard Day's Night before we go any further. It's huge, imposing, crass, flashy, trashy and expensive all at once. The statues of the four Beatles that adorn the plinths outside the first floor are absolutely terrible, but they somehow make sense as part of the ludicrous whole, and the buzz of activity through the shiny swing doors (guarded by mean man-mountains with Bluetooth headsets, of course) suggests an instant hit with the locals. In fact, I have a sneaking feeling that the HDN is a Liverpool institution in the making - shocking, arrogant and hilarious, it's a metaphor for the city itself. 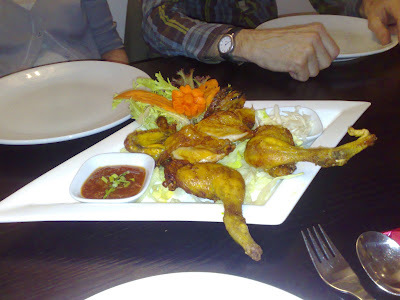 Meanwhile, Sabai is a contemporary, airy space with friendly staff and which serves middle of the road Thai dishes priced reasonably and presented without fuss. It's not earth-shattering, it's not even particularly authentic, but in a city where the height of sophistication was once a Bacardi and Coke in the Arena Bar, this is a thing to be cherished. 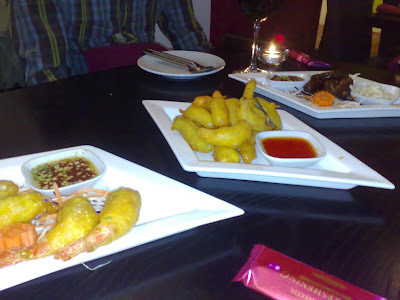 Starters of vegetable tempura, king prawns and Thai sausages were tasty bitesize fun, and my deep-fried marinated poussin (advertised as barbequed on the menu, but never mind) was succulent and full of flavour. 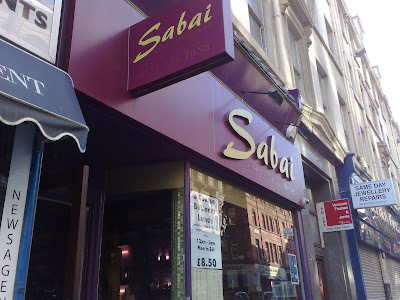 It goes without saying that somewhere like Sabai would struggle to get noticed in the capital, but even so it's a pleasing example that even the mid-range Liverpool places are starting to 'get' the restaurant thing. Liverpool's priorities have always been shopping first, eating second, and that isn't about to change. 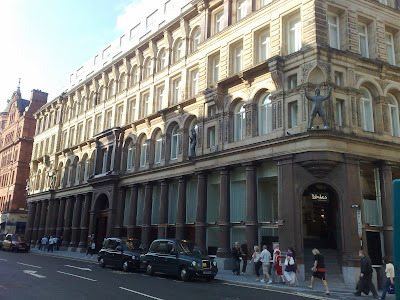 But is it too much to hope for that along with the raft of new designer shops in the 'new' Liverpool, we might expect to see some more designer food outlets to go with them? Fingers crossed.